I awoke shortly after 6a as night was grudgingly about to give way to day, and started the van to warm the inside, sitting in the back to dress and eat breakfast as I've done on countless occasions. This time, however, I wasn't out in the Mojave Desert or a lonely stretch of a remote highway but in a San Rafael suburban neighborhood. A car drove by slowly, turned around at the cul-de-sac and then seemed to drive away except that I saw it park on the adjacent street behind me. A man got out with a flashlight to note my license plate. I figured I was dealing with a concerned neighborhood vigilante and ought to help him chill a bit. When he walked up to the van I opened the side door and cheerily said hello. He looked at me a little askance, lifting the corner of his shirt to reveal a 7-sided badge and a holstered gun, "San Rafael Police." I smiled and replied, "You don't look like a police officer," thinking he seemed more like a George Zimmerman-type. "No?" he asked, somewhat incredulously. I continued, "No, you look like the guy that just got out of that Taurus that drove by and parked around the corner." He then went on to explain that when he saw a car running with all the lights off inside, he wondered what a guy from San Jose was doing in the neighborhood. That he knew where I was from tipped me off that he probably was police material. We had more discussion while I handed over my driver's license, all of it cordial, and in the end he informed me that sleeping in my car is against San Rafael City ordinance and thanked me for my cooperation. I had been in the neighborhood to hike in the nearby Sorich Ranch Park whose unnamed highpoint was a short 10min from the TH off Ridgewood Dr. I was out hiking shortly before 7a, the sky lighting up a few minutes later in a spectacular sunrise that faded in only a few minutes. The rest of the day would be heavily overcast, portending of the coming rain later in the day and diminishing summit views. In less than twenty minutes I had paid a short visit to the large oak found at the top and returned back to the TH. There is actually a good deal more to this park on the south slopes of the peak, but that was all I was interested in for the time being. There are three summits in the watershed north of Mt. Tamalpais itself that I had noted some days earlier. The shortest route to them would start at the Lake Lagunitas parking area. In looking over maps the night before, I found another starting location at Phoenix Lake Park to the east that would allow me to tag Bald Hill in addition to the other three in a moderately long, 13-mile outing. It was a shorter drive to reach from San Rafael and would avoid the $8 day use fee to park at Lake Lagunitas. Many of the trails throughout the watershed pass through second-growth redwood forests, a pretty and often quiet walk in the woods. Though spacious, the Phoenix Lake parking lot was nearly full when I arrived around 7:45a, evidently quite popular with early morning joggers out for a workout before heading to work. I started on Phoenix Lake Rd, going past the dam and around the north side of the lake, soon forking off on the Worn Spring Rd which I had intended to take to the summit of Bald Hill, my first stop. However, I was only 100yds up this second road when I noted the Yolanda Trail forking to the left. I didn't have a map with me but guessed it might be a more scenic route to the top and decided to take it and find out. It is a nice trail, but doesn't go to the top. After climbing an initial hill, it traverses around the hill's western slopes, joining with other trails along the way. I followed the trail for about a mile through lovely oak forest before noting a use trail rising steeply to the right. This trail did rise to the summit, climbing up grassy slopes peppered with lichen-covered rocks that made for a lovely scene before it eventually went over a rise to join with the Worn Spring Rd. I reached the open summit, true to its name, not long after 8:30a. After taking in the muted summit views, I descended back down the use trail to the Yolanda Trail and continued north to a 5-way junction, some of the trail options having been visible on my descent from Bald Hill. I then took the Hidden Meadow Trail down to Phoenix Creek and eventually to another multi-trail junction at Fish Gulch, west of Phoenix Lake. Two of the options, the Eldridge Grade Rd and Fish Gulch Trail were closed due to slides, but the Fish Gulch Rd leading up to the Lake Lagunitas parking lot was open, thankfully. Upon reaching the parking lot I took another series of trails to the top of Pilot Knob, overlooking Lake Lagunitas. 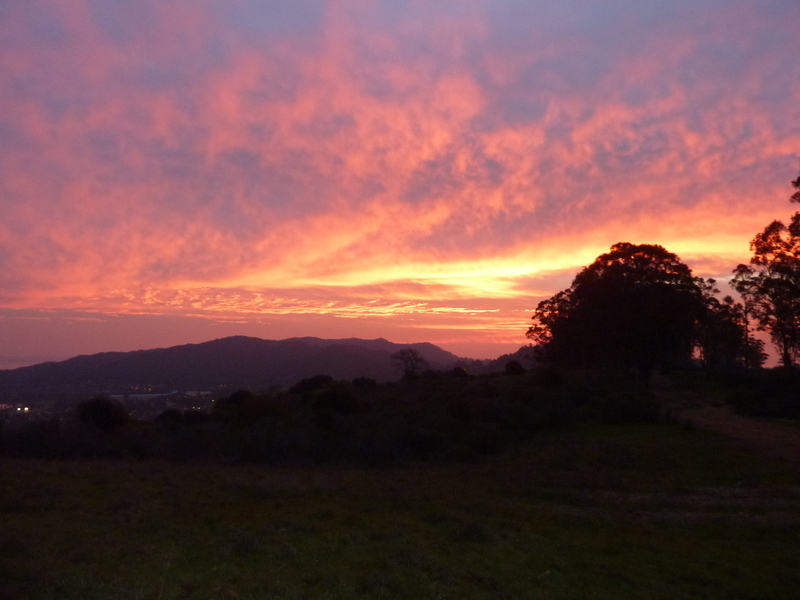 Like Bald Hill, Pilot Knob is a rounded, grassy hilltop open to views throughout the Tamalpais watershed. On my way back down I had to jump aside to keep from stepping on a small newt in the trail. A cute sign created by 3rd graders I saw later warned of such newts on the trail during the wet season. I would see more of them during the day, but they blend in so well with the ground and move so slowly that it is hard to avoid them. Back at Lake Lagunitas, I headed west on Rock Springs Rd for the other two summits. The fire road climbs about 600ft in a mile. At Rocky Ridge it forks before climbing higher still, but I had turned right onto the Rocky Ridge Rd. Rocky Ridge is the long north ridge of West Peak, the highpoint of Mt. Tamalpais and Marin County. LoJ has identified a local highpoint lower on the ridge as "Rocky Ridge", but it hardly counts as a summit. The highpoint seems to be amongst a clump of trees at the largest of three, similar closed contours. Not very interesting, this one. Just south of the highpoint is a junction with the single-track Stocking Trail which can be followed southwest across the Van Wyck Creek drainage to the adjacent ridgeline where Serpentine Point is located. The trail goes by Hidden Lake, a small, swampy thing that probably only holds water in the rainy season. Just past the lake, the trail T-bones into the Kent Trail which runs down the ridgeline to Alpine Lake. I turned left to follow it uphill to Serpentine Point, another nebulous summit with a poor claim to the title. I discovered a shortcut back to Rocky Ridge in the way of an older trail whose signs have been removed but is still quite serviceable. It seems to have been replaced by the maintained Stocking Trail I took earlier and does not show up on the park maps. It took an hour to return from Serpentine Point to Phoenix Lake, back by way of Lake Lagunitas and Fish Grade Rd. Utility repair work was going on near the lake, two technicians struggling to winch a cable back up onto a tree anchor from which it had been liberated during the recent storms. Finishing up at Phoenix Lake by 12:30p, I had time for some drive-ups before heading home. Ross Hill is only a quarter mile from the Phoenix Lake parking lot, but it took almost 4mi of driving to reach the summit area at the end of Goodhill Rd. The road ends at a couple of gates in this exclusive neighborhood with no room to turn around. Just down from the gates are some steps that you can climb to the fence around a water tank. Not quite the highpoint (which is on the property just south of the water tank), but as good as it gets without getting creepy or being a good friend of the folks that live there. A mile ENE of Ross Hill, Moore Hill is a 3mi ridgeline separating Ross from San Rafael. More upscale homes are found along the summit ridge, serviced by Upper Toyon Rd. One could easily drive up the road and park in one of numerous suitable spaces, but a sign at the entrance caught my attention, suggesting it is open to foot traffic only, an easement to reach the Open Space area at the end of the road. I parked just outside at the junction with Makin Grade and walked the half mile distance to the highpoint. At first glance, it appears that the top is located inside the gate of the pricey estate located there. There is a water tank immediately west of the home that has a formidable fence around it. Closer examination reveals that the highpoint is at the junction between the two properties and the fence has its weaknesses that are less formidable. I found my way inside and sidled up to the property boundary, unsure how I might respond if someone asked what the hell I was doing there. Luckily, no one did. Another mile to the SE, just south of Sir Francis Drake Blvd in Greenbrae, is Bon Air Hill, occupied by a large apartment complex. One can drive to within 100ft of the highpoint under a couple of redwood trees at a wooden platform in one of the courtyards. There is a convenient 20min parking spot to avoid parking in the reserved spots. At the SE end of the ridge shared with Moore Hill is this questionable highpoint located within the bounds of a pair of private estates found along Bret Harte Lane. Like Ross Hill, you can't really visit the highpoint without risking a creepy perp reputation.